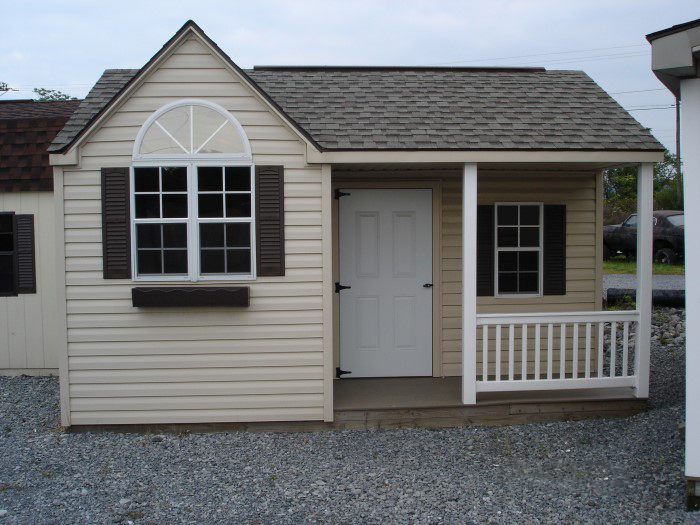 Our specialty shed designs are all variations of the original classic shed, the a-frame. With the addition of decorative accents, doors, or windows and modification of the roof pitch these new styles have been created. We hope you can find a style to accent your yard and home but encourage you to feel free to create your own. Our Victorian shed features a high roof pitch with a reverse gable. It also includes a 3’ single door in addition to the standard double doors. You have the choice of either placing an octagon window in the reverse gable or a half glass insert in the single door. Our Corner Nook style works great for the smaller backyard. Easily tucked into a corner, this compact design allows maximum utilization of your yard while providing the storage space you need. 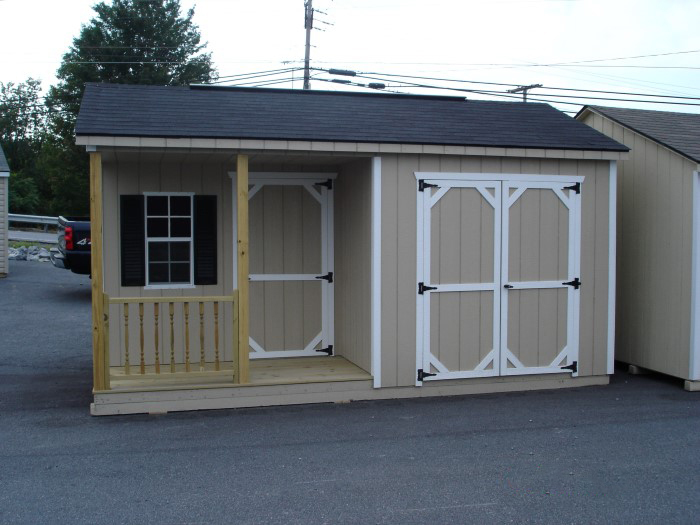 Our Classic Colonial shed has an added 6 inch overhang on all sides of its high pitch roof. It also features transom windows in the solid colored double doors. To complete the look, the windows are trimmed to match the overhangs, and finished with Z style shutters that complement the doors. 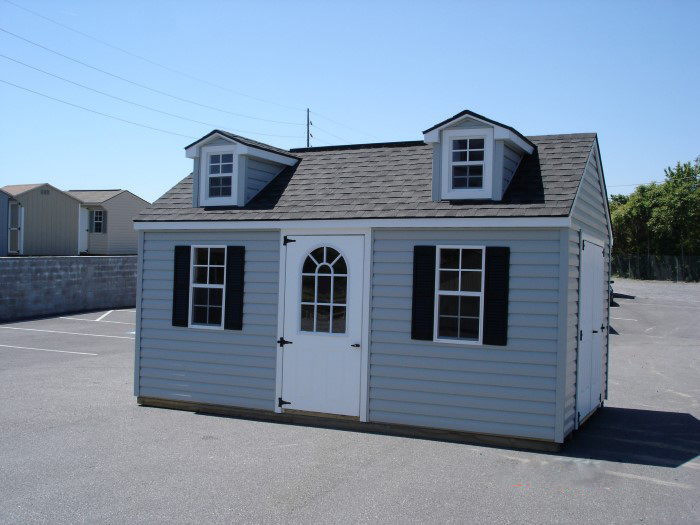 Similar to the classic colonial, our Nantucket features a one foot overhang on all sides of its high pitch roof. It has transom windows in its solid colored double doors with a decorative end vent completing the look. The windows are trimmed and then accented with Z style handmade shutters. Our Chalet features a one foot overhang on the gable end, along with a decorative octagon window over the entry door. A great shed for storage or with optional extra windows, a workspace for the green thumb in the family. This endearing shed style resembles a small house. Our Cape Cod features a high roof with two functional dormers. A set of double doors comes standard but a single door can be added for increased versatility. Decorative glass on the doors will give you a truly custom look. Our Cottage shed humbly boasts a functional porch and railing across part of the structure. Its decorative large reverse gable with custom round top window detail adds just the right touch of charm. Our Cabana style shed features a functional porch and railing across the full length of the shed. It is sure to add a relaxing accent to your own backyard oasis. This shed is a great addition to any yard, no pool necessary. A functional porch lends a new twist to this classic a-frame style. The four foot by eight foot porch it large enough to hold a small bench, while its 3’ door offers an alternative way into the building besides the double doors. Inside, a smaller area behind the porch can be sectioned off with an optional partition wall, allowing for a separate storage area for chemicals or a space for guests to change. All Framing 2x4’s, 16 ”o.c. Door and Window inclusions vary by style. Please contact salesperson for more information.